School of Vedic Maths is an Institution that aims at eradicating the fear of Maths from the minds of students. The school facilitates 'discovery' of new techniques in calculations and creating the element of 'fun' while doing Maths. The emphasis is not to teach but to make the students learn on their own. When any subject is 'taught' only the left brain develops, but when it is 'discovered' the right brain also develops. It is our endeavor to help enhance both sides of the brain thus bringing out creativity and hidden potentials. The strong belief that learning Vedic Maths and ancient Indian mathematics improves observation, concentration, creativity and numerical ability, is what drives us to travel across India imparting this priceless knowledge. Our approach to teaching is modern and accessible whereby we facilitate students are encouraged to discover new methods of their own making it more than simply studying. Being an enthusiastic educator, trainer and motivational speaker, Vinay Nair has been imparting the knowledge of Vedic Maths since 2009. He started the School of Vedic Maths with the aim to not only teach techniques but also to facilitate analytical thinking. He conducts courses, workshops, camps and seminars on Vedic Maths in educational institutions across India. A post-graduate in Commerce, Vinay Nair has earlier worked in Accounts & Finance with top MNC's in India and abroad before focusing his attention entirely on his passions – Teaching & Maths. His interest in Indian Philosophy and Psychology has helped him immensely in interacting with people of different age groups. 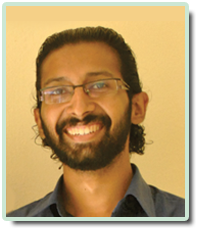 He has developed content for an Online / Postal Home Study Course on Vedic Mathematics for Chinmaya International Foundation (the International research wing of Chinmaya Mission). He has authored a book, The Teacher who Taught us to Think , on the teaching methods to make Maths interesting. He's currently working on three more books. He also writes for International Magazines and blogs on varied topics like Spirituality, Travelogues, Teaching, Ancient Indian Heritage, Psychology, and so on. An affiliate with the Chinmaya Mission, a global organization with over 300 centres round the world engaged in spiritual, educational and social services, Vinay Nair aspires to make Maths as unproblematic as it can be.